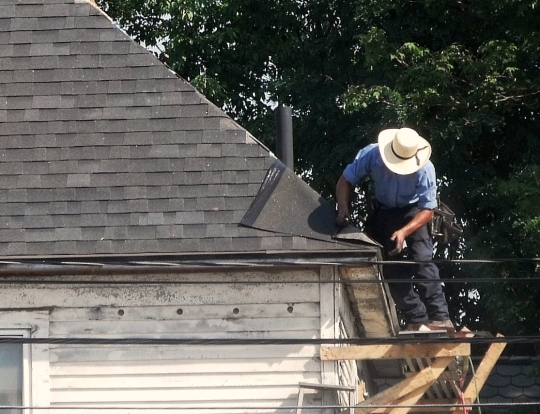 Pennsylvania is home to more Amish roofers than any other state. Amish roof contractors perform repair, replacement, and new roof construction. Find an Amish roofing company near you using the guide below. Many Lancaster County Amish roofers do work in the greater Philadelphia area (see next section for Lancaster Amish roofers). Metal roof replacement available along with fencing and other services. Amish owned and operated business located in Chester County PA within half an hour of the greater Philadelphia region. Amish roof contractors abound in the Lancaster County region. Lancaster Amish roofers do work within a 2-hour radius of the county (and sometimes even further away), a range which includes Philadelphia, Wilmington, Delaware, Baltimore, Harrisburg, Reading, Allentown, and Washington, D.C.
A one-stop outlet for a wide range of Amish-provided products and services, PA Dutch Builders offers custom roofing and siding, general contractor work and more. They carry a vast array of metal roofing vertical panel options, available in a variety of styles and colors to choose. Other Amish services and products include decks, fencing, porches, gazebos, siding work, pet structures and barns, contracting, and more. Chief Osceola Builders is an Amish owned and operated business running for nearly 25 years, started by company president and Amish founder Samuel S. Zook. They provide a full line of service such as new constructions, additions, siding, roofing, remodeling, and more, in the greater Philadelphia area. Specializes in siding, roofing, foundations, framing and more. Amish roofing and remodeling services available. Amish Construction company offers new home roofs, roof repair, preventative roof maintenance, roof inspection, replacement of old roofs and more. Roofs come in a broad selection of material and shingle colors. Thorough estimate information and jobs completed quickly (most within 2 days according to the site). Work and materials enjoy a 50 year transferable warranty. Red Well uses asphalt shingles and installs seamless gutters. Coverage area includes Philadelphia Main Line, Lebanon, Berks, Dauphin, York Counties. Kings Roofing & Siding service includes metal roofing and siding, replacement windows and doors, rubber roof coating and more done by skilled Amish workers. Offers masonry, carpentry, remodeling, roofing, siding, additions by Amish crews. New roofs, re-roofing and re-siding along with fiberglass shingles, metal roofs and aluminium and vinyl siding. Lancaster roofing contractor performing roof replacements, installing siding and more in York, Harrisburg, Lititz, Elizabethtown, Exton, West Chester, and Chester County areas. Company owned by former Amish. Also does work in surrounding states including New Jersey, Delaware, New York, Maryland and Ohio. Roofing, trimming, siding, framing service available. Amish roofing and siding work. Middle Creek Roofing is a local roofing contractor which provides roof repair and roof replacement services in the Greater Lancaster area including but not limited to Lebanon County, York County, Chester County, Delaware County, the Main Line, Montgomery County, Berks County and nearby. Middle Creek Roofing can help with all varieties of roof damage. Call for free roof estimate. Amish from numerous settlements north of Pittsburgh (Mercer County or the large New Wilmington Amish community) provide roofing services in the greater Pittsburgh area. Absolute Amish Home Improvement offers a full range of home improvement services covering interior work and exterior structures, remodeling, siding, roofing, masonry, decks and more. Non-Amish owned company staffed by all Amish workers. Amish Construction provides multiple services including roofing, siding, additions, remodeling or whole-house makeovers. Mike Sloskey Roofing & Construction offers high quality roofing work covering services such as roof repair, replacement, installation. Carrying high-quality roofing materials, and offering a broad choice of roofing options. Non-Amish company employing all Amish crew on the jobsite. New roofing, reroofing, roof cleaning and deck restoration among other services provided by Amish craftsmen. The Big Valley area of Mifflin County is home to a large Amish settlement. Amish roofing construction service available. Roofing as well as remodeling, pole sheds and decks. View the Amish roofing main page, with listings for other states including Maryland, Delaware, Indiana and Ohio. Hi Richard, thanks for your interest but this is not the place to submit estimate requests as it’s just a listing of Amish roofing businesses (ie this is not a roofing company website, just a directory). I’d suggest getting in touch with one of the above sources that is relatively near you. Amish normally travel up to 2 hours from their home communities for jobs, and sometimes further. Looks like you are located in west-central Pennsylvania so I’d think either the roof businesses listed for Central PA or Pittsburgh-area above would be possible choices. I’m not sure who there might do rubber roofing but a number of them offer diverse home and roofing services so probably worth a shot. Good luck! There is an Amish outfit in Puntsutawney, PA who do metal roofs. I lost their business card. Any ideas? I found your site and called Chief Osceola Builders. They came out the next day to give me a bid. They were very professional. I hired them to do my metal roof. They did a great job, very clean job site every day. Roof looks great. Just wondering if there are photos of finished work for my review.? I am glad to know you got the work done so soon. I am trying to locate Amish roofers in the Blair and Bedford Counties, Pennsylvania region. Amish roofers work in Southern NJ? I’d be interested in being contacted by Amish Roofers that would replace my roof in southern NJ near Deptford. Will Amish builders come into north NJ? I live about 30 minutes east of Easton, PA, just of route 78, a town called Gladstone. I will have some barn roofing needs, replacement of plywood, I assume tarp paper, and then shingles, in one area, and then on a lower level, shallow slope, replacement of roof, with rubber membrane, any thoughts on if a solid Amish builder might have the interest? will Amish roofers come to Bucks county pa ? In search of Amish company to remove large slate roof in Sugarloaf mid August. Any recommendations? The Amish of Airworks Construction did a great job putting on a metal roof for me. They were hard working, polite, and cleaned up afterwards. The job was done in a day since they had about nine of them doing it. I do recommend the 26 inch gauge metal. It is heavier and recommended by the industry. It is a little more expensive. There are many options with the metal as well. So one should check out different manufacturers of the metal as well. Daniel was easy to work with and got me answers when I asked. Thanks guys for a job well done. We have a metal roof on our house, garage, shed, and barn that are still in good condition but need painting. The roofing contractors on your website that replace metal roofing do not mention if they also paint the roof. Any suggestions please. Located in Boalsburg pa, where can I find an Amish roofer? We have a metal roof on our house, garage, shed, and barn that are still in good condition but need painting. The roofing contractors on your website that replace metal roofing do not mention if they will repaint a metal roof. Yes, we have not hired anyone yet and are still looking for a painter. Is there any amish that do roofing close to erie, pa??? NEED ROOF SURVEY FOR INSURANCE CO.
WE AT COUNTRY MEADOWS CONDOMINIUMS IN MORGANTOWN, PA NEED A ROOF SURVEY OF 109 ROOFS TO DETERMINE HOW TO CURE ROOF LEAKS, IS IT STRUCTURAL, FLASHING, SHINGLE FAILURE OR OTHER. PLEASE SEND RESUME AND HISTORY OF SIMILAR TYPE WORK. Hello. Nice website! Would it be possible to find a team of folks who could install a roof in Ithaca, NY? I’m leaning toward a metal roof, and I can feed people local organic food while they are on break. I want to put on a metal roof on my 2 story house and maybe my garage. I live in Erie, pa. Can someone please let me know how I can find Amish roofers in my area?? thanks!!! We live in the Harrisburg area and have a metal roof on our house, barn, shed and garage that are in good condition but very much in need of painting. We tried last year to find a painter but it was too far into the season. The past winter has been hard on the roof and they definitely need to be done this year. Any help is appreciated. I am looking for a metal roof, and would appreciate a reply. I am interested in construction as soon as possible. Hello Veronica! My name is Ritchie King with Ritchie’s Home Improvements!! I would be happy to assist you in your project!! My cell(717)-629-4404. My email address is richy.jk@gmail.com!! I am looking forward to hearing from you!! we have a gazbo that needs a new roof. small job,live in pottstown,cedar roof large gazbo. Would you know of any one roofer close to our area? Or somewhere I could get the shakes without middle man. I live in Morrisdale PA and I’m looking for an amish contractor to give me an estimate on a garage. A pole style one would be ok. I had one amish contractor contact me and promise to call me back but he never did and I didn’t get his number. Could I get a contact for an amish contractor who would do work in Morrisdale. I can be reached at 814-553-2633 or roy4dar@gmail.com. Thanks. I need to contact a roofer named Ben. He did a job in Ridgway PA about 2 weeks ago. We live around 2 miles from the PA Turnpike Irwin Exchange (Exit 67). I met a homeowner from Jeannette, PA a couple of years ago who had an Amish contractor from Johnstown install a metal roof. The owner was very happy with the results. Jeannette, is probably 5 miles further East than us. Unfortunately, I don’t know his address or last name to try and contact. I have been unable to find any reference to a contractor specific to Johnstown which is about an hour East of us. We have a cape cod style home (12/12 roof pitch). House rough dimensions are 76ft long by 26ft deep with three dormers. I would also probably be interested in replacing sofit, facia and gutters depending on price. Does anyone have a name of a contractor with a Johnstown address? Hello. We have an older barn and the past wind storm blew up and twisted about a 5-6 foot section of the roof which now needs repaired. Also, we also need other sections nailed or screwed down. In addition, would also like some of the barn wood siding renailed and/or repaired for future painting. Thanks! I am looking for a metal roof for my jome . Any Amish roofers in my area? Hello there, we are in need of a metal roof on our home. We want an amish roofer to do it. We live in lehighton pa and hope to have someone close that can help us and give us an estimate…..we also have an old garage that is falling down and made of barn wood. Good wood to use if you make furniture. Maybe we can make some kind of a deal for amish to take down garage and keep the wood for a metal roof on our home. Really need some help. Please call linda at 4843309906 thank you for your time. Is there an Amish roofer out there who would come to the Poconos (Stroudsburg,PA)? I would like a metal roof if reasonable price. 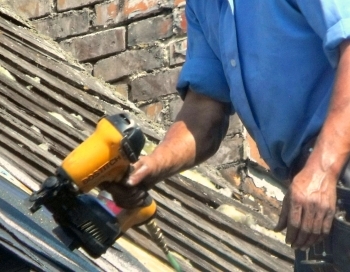 Did you ever find a roofer for your home in Stroudsburg? I’m looking at a home in Tobyhanna that needs the roof replaced. Live in Maryland and don’t know where to start. I’m searching for an Amish roofer in Columbia county pa. I noticed most are located far from me. I saw the Poconos listed on yours and wonder if anyone got a hold of you and if so could you e mail me. I know this will sound like a random comment, but do you do any guest blogging? expand on my current blog, but the topic Im blogging about is roof covering. Need to get our roof replaced, any amish roofers that come to Prosperity, PA. Thanks! We live in Altoona Pa and need a metal roof on our home…if anybody knows of any Amish contractors, roofers, workers, crews, etc that work in the Altoona Pa area please respond and thank you. I lost the business card I had for the Amish crew that put a metal roof on the business next door to me. Really nice, polite gentleman. Hello…are there any Amish roofers in the 15473 zip code area? I am looking to get the shingles replaced on my two story home. Currently, there are three tab shingles and I would prefer them being replaced with three tab Owens Corning shingles. Any assistance is appreciated. Referring myself to http://amishamerica.com/about/, I am looking for highly skilled roofers, plasterers, bathroom remodelers, and interior painters for a major project at my residence, and would prefer hiring Amish craftsmen because of the high reputation of the Amish as regards their dedication, integrity, and skill in such matters. Could you send me the names, telephone numbers and email addresses (if any) of such craftsmen who might be interested. The work would be done at and on a large house (3,800 square feet) in Carlisle, Pennsylvania. Much if not all of the work would preferably have to be done in June and July 2019. I would appreciate finding out the list of known and reputable Amish-owned roofers operating in Cambria County, Johnstown, PA . I have a house that will need its present shingle roof replaced with metal roof. Please, post here your comments . I will read them back for follow up. Thanks. Any recommendation for any Amish roofing companies willing to travel to Luzerne County to give an estimate and replace a roof. Any intel would be appreciated, thank you!